A great Hollywood style gunfighter cowboy holster and belt. An unlined A1 QuickDraw holster and authentic, hand cut contoured to drop at the hip, reinforced Buscadero style gun belt. 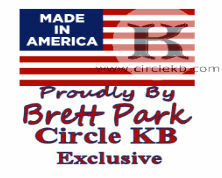 Special cut from 10-11 oz heavy gauge leather for durability and long term stand-up. 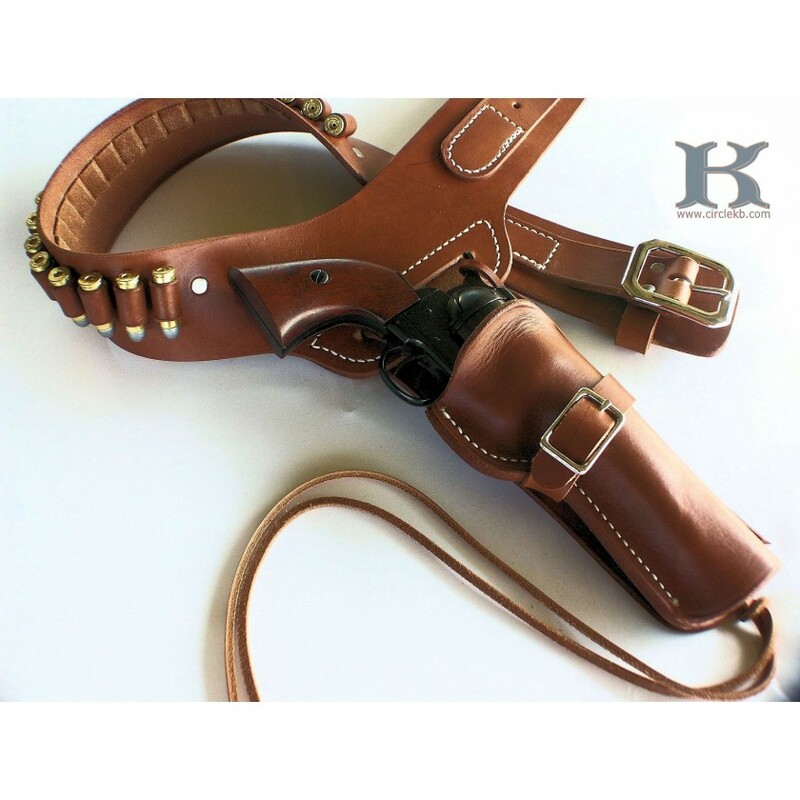 The Buscadero Belt is an unlined version of the belt that accompanies all of our gunfighter style holsters like the A1 QuickDraw. The outfit is made from top grade double shoulder cowhide. 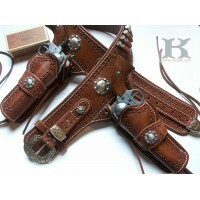 The belt is 2.75" wide with an old style California Clipped Corner Nickel buckle. We reinforce the belt where it drops at the hip and hand oil to finish. Easily fancy up your outfit with hand tooling or conchos. Order in single or double strong or crossdraw. 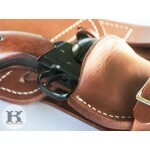 Unlined A1 Quickdraw Holster is hand cut from Hermann Oak® Leather the Premium USA Vegetable tanned cowhide. We wet form the holster and dry it using your gun model. Finished with a 100% Neatsfoot oil hand rubbed to color and condition. You can also choose a hand dyed color in Mahogany or Black. The unlined Buscadero belt is hand cut to drop nicely at the hip. Each bullet loop is hand laced wet and dry molded to your bullet caliber. (you wont have threads tearing and unravelling) and the loops will not collapse. The 2.75" wide gun belt carries 20 rounds. If you want to carry more just let us know. We can add loops for $2 ea.